It has been said a giving heart will never die. It’s appropriate to mention this because it is National Donate Life Month. 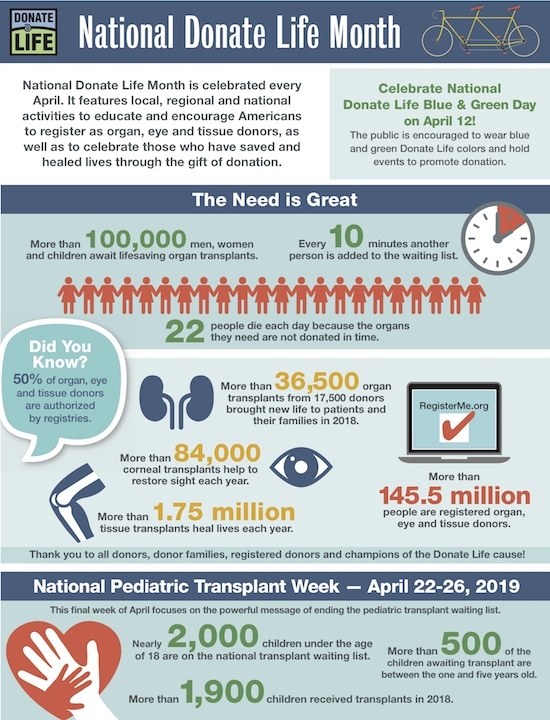 More than 110,000 men, women and children in the U.S. are currently on a transplant waiting list. An average of 22 people die every day waiting for organ transplants. Last year, more than 36,500 transplants were performed in the U.S. The kidney was the first human organ to be successfully transplanted, and that happened in 1954, according to the Health Resources and Services Administration. Organ donation takes healthy organs and tissues from one person for transplantation into another. Experts say that the organs from one donor can save or help as many as 75 people. Organs you can donate include internal organs: kidneys, heart, liver, pancreas, intestines and lungs. You can also donate skin, bone and bone marrow and corneas. You can find more information at www.donatelife.net. Many of you may have read the essay written in 1976 by Robert Test titled “To Remember Me.” Test was a pioneer in promoting organ and tissue donations. He died in the fall of 1994. The poem was first published in The Cincinnati Post and has appeared frequently in the columns of Dear Abby (April 25, 1989) and Ann Landers. It follows. “At a certain moment a doctor will determine that my brain has ceased to function and that, for all intents and purposes, my life has stopped. “When that happens, do not attempt to instill artificial life into my body by the use of a machine. And don’t call this my ‘deathbed.’ Call it my ‘bed of life,’ and let my body be taken from it to help others lead fuller lives. “Give my sight to a man who has never seen a sunrise, a baby’s face or love in the eyes of a woman. “Give my heart to a person whose own heart has caused nothing but endless days of pain. “Give my blood to the teenager who has been pulled from the wreckage of his car, so that he might live to see his grandchildren play. “Give my kidneys to one who depends on a machine to exist from week to week. “Take my bones, every muscle, every fiber and nerve in my body and find a way to make a crippled child walk. “Explore every corner of my brain. Take my cells, if necessary, and let them grow so that someday a speechless boy will shout at the crack of a bat and a deaf girl will hear the sound of rain against her windows. “Burn what is left of me and scatter the ashes to the winds to help the flowers grow. “If you must bury something, let it be my faults, my weakness and all prejudice against my fellow man. “Give my soul to God.